Pear shape, plain stem, GP Rotaflo stopcock. Conical, plain stem ,GP Rotaflo stopcock. Cylindrical, stem in line with cone, glass stopcock or GP Rotaflo stopcock. Pear shape, glass or GP Rotaflo stopcock. Open top stem with cone, GP Rotaflo stopcock. 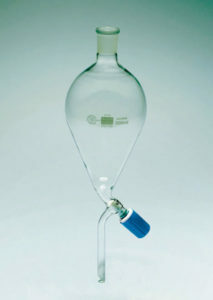 Pear shape, with GP Rotaflo stopcock, for use when liquids have to be introduced into vessels under vacuum or slight positive pressure. This range is recommended for use with obnoxious or corrosive liquids. The funnels can also be used with Soxhlets as solvent traps to facilitate recovery at the end of an extraction.